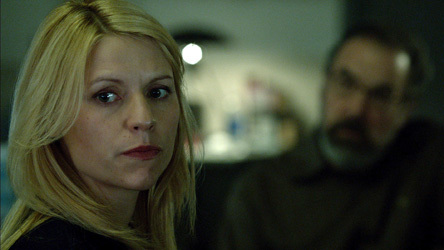 On last week’s episode of Homeland, Brody almost blew the whole operation with Roya Hammad. The pressures of being a spy caused his will to crumble. After Carrie helped him regather himself, he was captured and taken to an unknown location by Roya Hammad. With the disappearance of Brody, Carrie pushes to make a move on Roya Hammad. She does this under the assumption that he has been killed in action or has been turned. If he’s in fact dead or has been turned that would be the easiest route because they can make a move on Roya Hammad. The other alternative is that Brody is alive and hasn’t been turned. If that is the case and they do make a move on Roya; Brody’s cover will be exposed and he’s a dead man. This tough decision that Carrie has to make leaves her quite shaken. Thankfully, Brody calls before they can make a move on Roya. He ask for the help of the CIA to put his family in protective custody. Saul and the team see this as a good sign because if he’s trying to protect his family than he’s still playing ball with the CIA. Upon Brody’s capture he is not tortured but rather held with the idea that he will be tortured. Fearlessly, Brody faces this test by Abu Nazir without faltering. Abu Nazir’s attack on U.S soil is revealed to Brody. The attack is to take place at a troop homecoming event. This event would be welcoming over 300 soldiers coming home from war. If an attack were to take place at this event the results would be catastrophic. Roya Hammad would be helming the attack as a news reporter. There is one detail that Brody does not tell the CIA about his meeting with Abu Nazir. During their conversation with Brody, he has a flashback of praying with Abu Nazir. This is triggered when he is asked if there is any other details that he can tell them about their meeting. It’s suspicious that he declines to reveal that segment. It’s sad if he feels shame for being a muslim. A man shouldn’t feel shame for practicing a religion. The other possibility is that the flashback was much more than what was showed on the surface. It could have been Brody was sharing an intimate moment with Abu Nazir and there is more that he is hiding. Saul shares his reservation with Quinn on Brody. Quinn believes Carrie should be more cautious with Brody. It’s becoming clearer and clearer as the series goes on that Carrie’s feeling for Brody are becoming stronger. This romance is at times awkwardly inappropiate. It makes me not respect Carrie’s character at times and takes away the believability of the show. This romance isn’t the only one happening on the show. With Brody gone, Jessica and the family are moved to a new home for protective custody. It seems like everyone in the family is turning their backs on Brody. Mike Faber and Jessica lose themselves to temptation and sleep together. It’s hard to feel angry at her when you know that Brody is also being adulterous with Carrie. It helps that Mike has been a really good role model for Chris and Dana. Carrie’s earlier doubt’s of Quinn’s credentials reveal themself in this episode. Saul uncovers the fact that Quin’s clearance is way higher than needed for his team. When he brings it up with Estes later on he brushes it off on the fact that everyone is on the same team. Frustrated, Saul let’s it be for the time being. He can’t be sidetracked when they are setting up Roya Hammad for a trap. After confirming that Roya’s camera crew are transferring the bomb they stop Roya’s plan. Unfortunately, when the smoke clears ; they still don’t have Abu Nazir. In a turn of events it seems that Brody is a truly expendable man. Quinn and Estes planned to eliminate him If Abu Nazir was caught. With Brody’s cover officially blown, the next episode of Homeland seems to be very promising. Hopefully now, Brody will finally be able to break the hold that Abu has over him. First series superb, second not so much. Less said about the third the better.